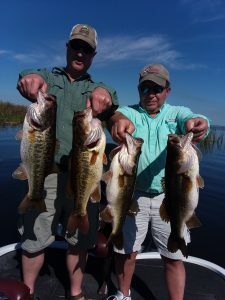 Delbert and Dave both caught a ton more fish today we lost count but it was still a blast! Today we did not catch as many BIG bass but we did catch one that was 6 1/2 lbs. The wind started picking up today which will make fishing for these fish a little tougher this coming week. With the water temps. perfect for these fish to eat the coming weeks should continue to bring good numbers of quality fish. This weekends tournament is guaranteed to bring some big bags.